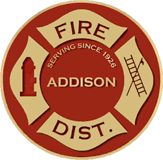 The Addison Fire Protection District Foreign Fire Insurance Tax Board is tasked with receiving and accounting for all monies received from the two percent tax on fire insurance policies sold by foreign (outside of Illinois) insurance companies. In accordance with Illinois Compiled Statutes, the Illinois Municipal League collects this two percent tax from out of state insurance companies that do business in Addison. These funds and this Board operate in accordance with Illinois Compiled Statute 70 ILCS 705/11i. Per statute, this money is to be used for the maintenance, use and benefit of the District. The FFITB consists of seven members of the fire district. Six members are elected annually at large by the sworn members of the fire district and the seventh member is the fire chief who holds the office my virtue of rank.